The Taliban first time entered Bamyan city 13th September, 1998 after short fighting on Aghrubut pass. On 15-17 September the Taliban launched search in Bamyan villages to find out suspect people. 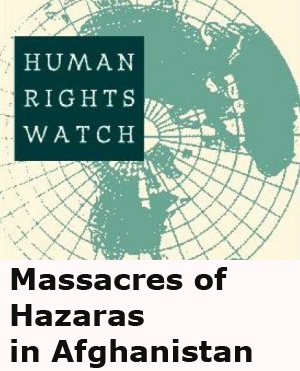 During their search they arrested and killed any male members of Hazara above thirteen. Arrested people were taken to desert and then assassinated. Sar Asyabb, Haider Abad and Syed Abad villages were among the villages, which suffered more. Some people were slaughtered herd and some bodies were cut to pieces. Houses were burnt or destroyred. I was reported that dead bodies were scattered everywhere. Five bodies were found in Azhdar, three were behind guardroom of Bamyan airport and several bodies were found among trees behind new Bazar. Many people were killed from displaced families who were living around Buddha statues but following the capture of city they went to nearby villages. Reportedly Abdul Wahid and Maysam two workers of ICRC who decided not to leave their office were also killed. It was on the second day of the Taliban presence in Bamyan, that two groups of non-Afghan Talibs based in Iranian Consulate building and Bamyan Laycee (High School) targeted the small Buddha by Tank and BM 40 Artillery. These shelling caused some damages in the lower part of its body. Then climbing the statue, they dug its head, filled it with explosive stuff and set it off. The explosion defaced small Buddha and created some cracks in its body. 230 Trucks ( Kamazand ten wheelers Trucks) were taken by different groups of the Taliban. The Taliban promised to return looted trucks but so far only two trucks have been given back to the owners. There were also reports of looting of the peoples household furniture and public properties.